Basal Metabolic Rate Calculator 1.0 free download. Basal Metabolic Rate is the number of calories your body needs when you are resting. Basal Metabolic Rate is the number of calories your body needs when you are resting. Multiplied by your activity level, Basal Metabolic Rate lets you estimate how many calories you need to lose weight or maintain your current weight. BMR Calculator is a useful application that allows you to calculate Basal Metabolic Rate without learning any math formulas. 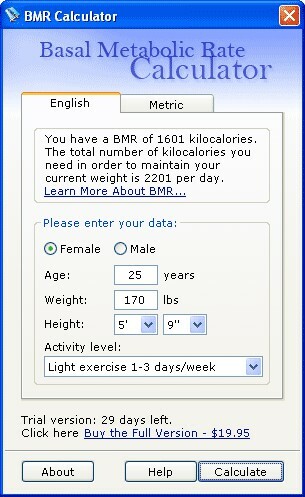 Just select your gender and activity level, enter your age, weight, and height. BlubberPatrol is the quick, and easy solution to keep track of your dieting progress. Fitness Assistant is a comprehensive training and nutrition software supporting a myriad of features every dieter, athlete, or fitness enthusiast must have. Enter your body weight, gender, number of drinks, and hours drinking and it calculates your blood alcohol level. Body Account is an application developed for those people who care about their bodies weight and shape. Athlete's Database Gold tracks and analyzes cardiovascular workouts, weight lifting, measurements and weight loss.